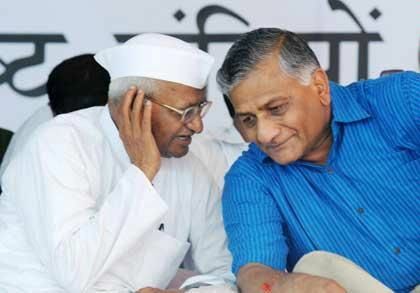 Anti-corruption activist, Anna Hazare and the former Army Chief, General V. K. Singh has described the present union government as "unconstitutional" and have demanded dissolution of Parliament. General Singh said that the government has completely disregarded the soul and spirit of the Indian constitution. He also accused Prime Minister Manmohan Singh of ignoring the principle of collective responsibility. The two said in a joint statement that the people in the country have completely lost faith in the government. The joint statement read, "People have completely lost faith in the government on the issues of land, water, forest and mineral wealth due to rivers being privatised, forests being sold to private companies and tribal people being displaced from their traditional habitat." The two would begin a national tour from January 30 to spread awareness through a programme that would guide people to elect representatives who take their cause to the union parliament. Mr. Hazare announced that a committee including 1,200 Indian Institute of Technology (IIT) engineers has been formed to implement the programme. General Singh said that the committee will back candidates that show good image, an eagerness to serve and competence.